Family and friends of Perita Price are raising money to pay for uninsured medical expenses associated with transplantation. Perita has chosen to fundraise with HelpHOPELive in part because HelpHOPELive provides both tax-deductibility and fiscal accountability to contributors. Contributors can be sure that funds contributed will be used only to pay or reimburse medically-related expenses. For more information, please contact HelpHOPELive at 800-642-8399. 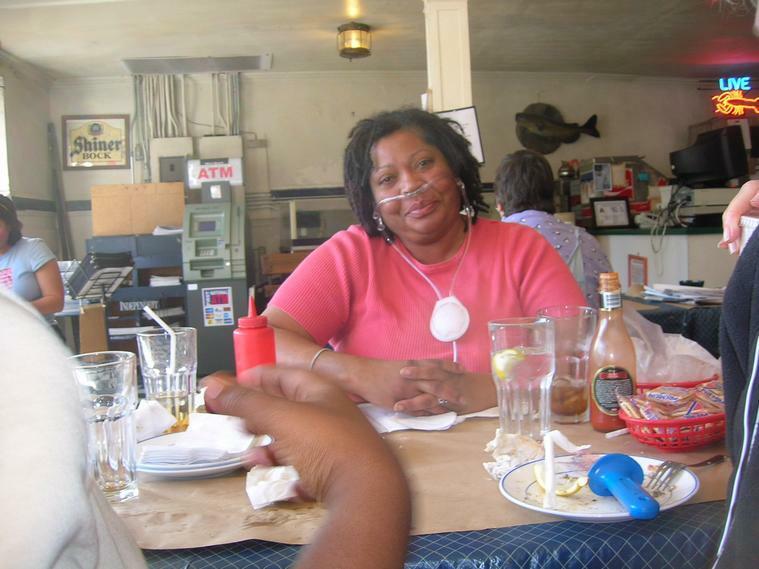 Our mother, Perita Price, desperately needs your help. She was diagnosed with Pulmonary Hypertension, an incurable lung disease, in 1998, just four months after becoming a widow with the responsibility of raising two kids. Over ten years she has fought the disease as it worsened requiring higher oxygen levels in addition to a medication administered continuously through IV infusion. 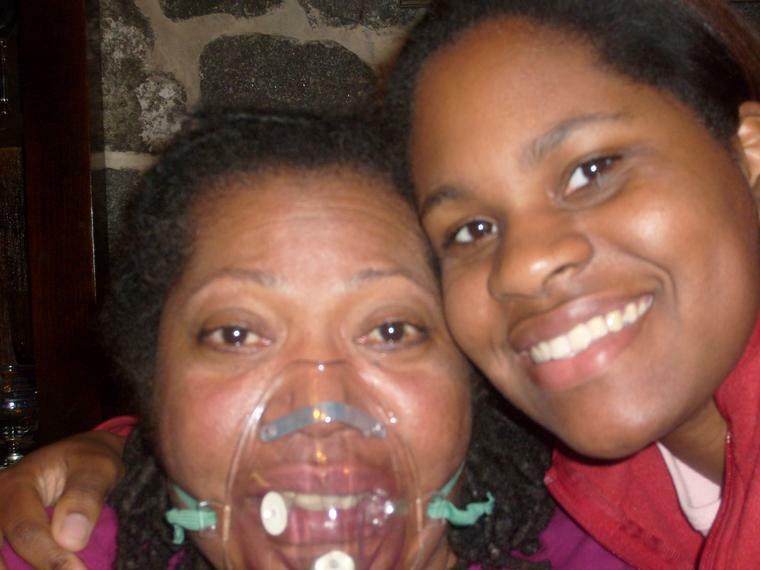 Her rate of supplemental oxygen is so high that it limits her to ground travel only and requires a host of planning and coordination whenever she attempts to leave her home. Because of the deteriorating condition of her lungs, the only remaining medical option is transplantation. In November 2009, Perita was evaluated and, due mainly to her sheer effort and determination to maintain as healthy a lifestyle as possible through exercise and nutrition, was deemed by her medical team to be an excellent candidate for transplantation at Duke University Medical Center in Durham, NC. As you may know, transplantation is very expensive. Even with health insurance, there are extraordinary expenses and out of pocket costs such as deductibles, copays and immuno-suppressant medications post transplant. This has presented a challenge that we find we cannot meet alone. This is where we need your help. We thank you in advance for your generosity and support but most importantly for your prayers. Contributions are tax-deductible to the extent allowed by the law. This campaign is administered by the HelpHOPELive, a 501(c)(3) nonprofit providing fundraising assistance to transplant and catastrophic injury patients. Information: 800-642-8399. Financial information about this organization and a copy of its license are available from the North Carolina Office of the Secretary of State, State Solicitation Licensing branch at 1888-830-4989. This license is not an endorsement by the state. If you don’t know, Perita will be eligible to get listed for a lung transplant this year. Perita has to lose A LOT of weight in a short time to meet her goal to get listed for a life saving lung transplantation. And she needs your help in raising money. Don’t have it right now? Funds are low? Not a good time?… Don’t fret! There is a fun, healthy way you can make a lasting contribution to Perita and to yourself. Ate too much over the holidays? Want to be a part of the skinny jeans trend, but the gut is holdin you back? What better way to show your love, support and care to Perita then to join the 2010 challenge and lose weight too. Be in Perita’s Power 10! I’m working to get 10 of Perita’s closest family and friends to not just donate but participate in helping Perita and you get healthy. You ask your friends to sponsor you in your weight loss challenge by contributing a donation, sure you may get a few “get reals… you’ve done this before’s… and yeah yeah what else is new’s” nay-sayers. But the glory will be showing them you can do it! To make it interesting… if you don’t reach your weight loss goal, you will give them their money back (I’m sure people will be willing to cough off some big bucks to see if you can put your money where your mouth is) And you will incur the sponsorship dollars to donate. We will have a ton of fun doing this for Perita and as a family, and won’t we all rejoice to living to a healthier beat. There will be a ton of support to come, with recipes, workout tips and more. Please let me know if you are willing to participate by 1/6. I know its short notice, but so was that last piece of cake you just put down, in other words you didn’t plan on it J… Make your New Years Resolution a reality this year, and show Perita that she’s not in this alone. 1. Email me your weight and weight loss goal (Weigh-in’s to occur every Friday) this Friday sets your baseline starting weight. If you don’t wish to share your weight with me you can submit your weight as 0 (write down the actual for yourself) and then each week you can send me +1 or -2 based on the loss or gain for the week (your weight will not be shared with anyone). 2. See the attached document and copy and paste into an email to get your sponsors! This is a sample letter that you can send to your family and friends to get pledge amounts. I will need you to submit your total pledge dollars by 1/15. There will be a grand prize that will go to the person with the greatest weight loss! If you have any questions don’t hesitate to email me. PERITA’S HOPEThe Cedar Grove Ambassadors (community and friends) are doing fundraising events (Perita’s Hope) to support the lung transplant of Perita Price. Please bombard heaven with prayers for Perita and also reach deep in our pocketbooks or wallet, under our mattress, where ever your money is stored and help in this worthy cause. or you may email your request up to 8 pm; 12 March to Brenda Hewett at [email protected] Please indicate you phone number on email. 1. Dinner Sale: Plates of fish, chicken, shrimp, $8. $9, $12; this includes 2 vegetables, dessert, and drink. I will email you a flyer later on specific menu items and prices. 2. We will also have Perita’s Hope Ribbons on sale for donation of $1.00 or more. Perita’s Hope All Day Festival, Democratic Building, Boliva, NC- 25 March-8 am until. Food, music, praise dance, skits, crafts, yard sale items, silent auction, etc, etc. all day. Please support Perita’s Hope events. 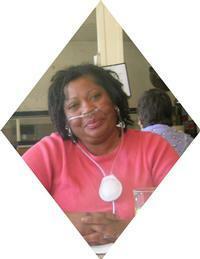 Perita Price was diagnosed with Pulmonary Hypertension, an incurable lung disease in 1998. 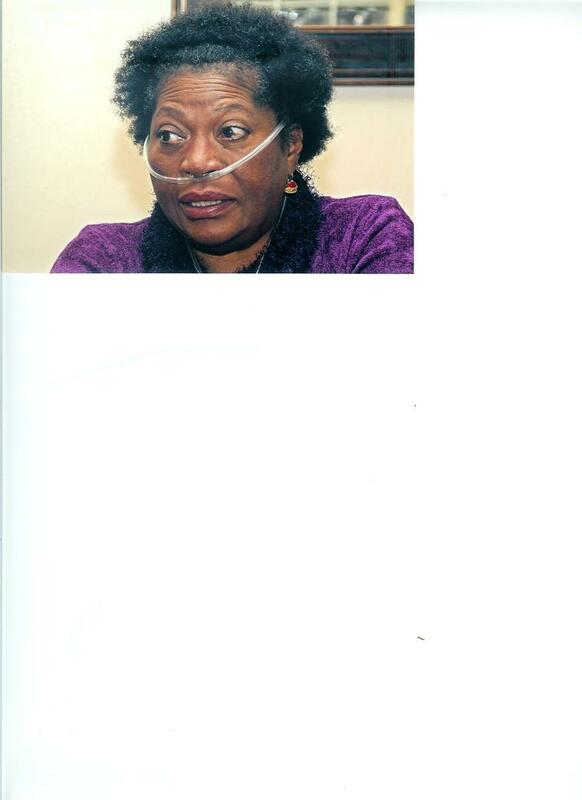 All these years she has fought the disease as it worsened and deteriorated the condition of her lungs. Because of this, the only remaining medical option is transplantation. Help us put the “FUN” in fundraising by bringing a friend and joining us for a glass of wine & some appetizers while we shop the Silpada Jewelry Boutique and RAISE MONEY for Perita’s transplant. 100% of the proceeds will go directly towards her transplant so EVERY ORDER COUNTS! Can’t make it but want to support the cause? View the FULL catalog online at my website: www.mysilpada.com/belynda.evans then contact me to place your order at [email protected] or 919.215.1583. All orders ship direct to you for only $4 and arrive within a week. Please mention “Perita” when you place order. Book your own party by Sept 30th and add’l monies will be donated! Visa, Mastercard & Personal Checks Accepted. Ms. Perita, I'm sorry that I missed the fundraiser last weekend, but I still want to contribute. Praying that you have a donor soon. God Bless!